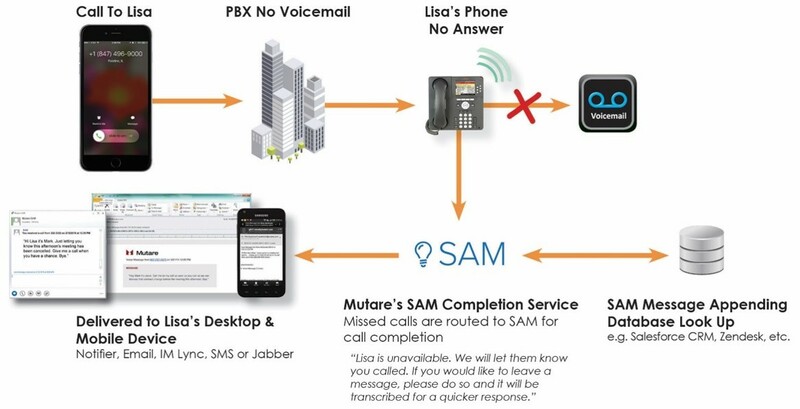 Smart Assist By Mutare (SAM) is a disruptive new technology solution that replaces voicemail with a modern digital call completion solution. SAM is not voicemail. SAM is a completely new technology that answers missed calls, eliminates voice mailboxes for users and cuts enterprise costs 20% to 50%. Coke and Chase recently made headlines over their decision to reduce and, in some cases, eliminate voicemail services for their employees, but hanging up on callers is simply rude. On the other hand, employees need better tools to handle missed calls and message waiting lights, dialing to retrieve messages, entering PINS and managing greetings. Employees don’t want to manage voice mailboxes, but they do need to be able to quickly handle important messages and be able to ignore phone spam. That is why Mutare invented SAM.